It was a busy night for the Unionville-Chadds Ford School Board on May 18, but one of the first actions they took was approving the appointment of a beaming James Conley as the next principal of Unionville High School. James Conley was appointed as the new principal of Unionville High School on May 18. 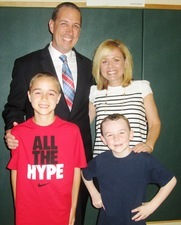 Conley, who had been the assistant principal, came to the board meeting with his wife Michele, and sons Joey and Jimmy Jr.
Conley, who had been serving as the assistant principal at the school, will be taking his new position on July 1. He came to the meeting with his wife and two of his three sons as the board unanimously voted to appoint him. Conley's salary will be $142,290, and his specified eight-hour day “will be longer than eight hours, I can promise you that,” said district superintendent John Sanville, smiling. “Thanks very much," Conley said as the audience applauded. "I'd first like to thank the board, and Dr. Sanville. I'm very excited. I promise you I will work tirelessly for the students and the staff and the families of Unionville High School to continue the level of excellence that is a hallmark of who we are." The board heard an initial report from the Wellness Committee, which has been working since January to come up with a new approach on issues including substance abuse, mental health, concussion management and personal resilience, which ties into the district's anti-bullying efforts. The presentation was in outline form, and the board will be discussing specific steps for the Wellness Plan in coming meetings. During public comment, seven people -- at least one of them a teacher in the district -- stood up to address the board and administration on the subject of teacher contract negotiations and the upcoming final budget decision, which the board will make on June 15. At their May 13 meeting, the board had narrowly approved a 2.01 weighted average millage increase, or about $126 more per year for an average homeowner in Chester County. The average county taxpayer now pays about $7,950 in school taxes. In Delaware County, the average taxpayer will pay an additional $163.50 (a 2.8 percent increase). The proposed millage rate will be 26.92 in Chester County (a 1.82 percent increase), and 22.83 mills in Delaware County (a 2.84 percent increase). The spending plan in the district totals $79,294,443. The residents at the May 18 meeting universally called for a better salary and benefits package for the district's teachers, even if that means raising property taxes more than the amount approved at last month's meeting. Each resident said they had moved to the district largely because of the reputation of the schools, and that they were willing to pay more to keep good teachers. "We can do a better job than what you're doing right now," one woman told the board. "Please come to the table with a better package for the teachers. If you have to raise our taxes, do it. The extra 44 cents a day it will cost the taxpayer is not going to break us." Several residents cited reports that the benefits package given to Unionville-Chadds Ford teachers is ranked ninth or tenth out of 13 surrounding school districts. A teacher at Unionville High School asked, "Why isn't the board willing to invest part of their large reserve fund in teachers? What 'rainy day' are you saving my taxes for?" The strong comments struck a chord with board members, who had voted 5-4 to approve the 2.01 millage increase at their last meeting. "I have heard you tonight," said board member Kathleen Do. "We have a long way to go in the teacher contract. But it's important to understand that this all comes down to the budget. About 70 percent of our budget goes to teachers and staff salary and benefits. I would urge you to be involved in the budget process. We had a budget hearing in the first week of May, and there was only one person from the public there. We make decisions about the budget, and often we don't hear from you. I really believe that we need to. I was deeply disappointed last week when this board voted on the proposed final budget that takes almost no exceptions and, in my mind, leaves very little flexibility as we move forward on a number of items, including the teacher contract." Board member Gregg Lindner added that, "I was also disappointed in the vote last week. We have another chance in June to hopefully get a different vote." Board member Keith Knauss read from a prepared statement regarding his vote last week for the 2.01 percent increase. "I can sum up the contract talks with two numbers -- 4.6 percent, and 2.1 percent," he said. "4.6 is the increase in payroll the leadership of the Education Association is asking for each year, for three years. 2.1 percent is the increase the board is offering, which is representative of the world everyone else is living in. We are living in a 2 percent world. The difference between 2.1 and 4.6 percent might seem small, but I can assure you that we are talking about a difference of millions of dollars. I'm hearing from my neighbors -- some of whom are on fixed pensions that don't increase from year to year, and some rely on Social Security that had a cost of living increase of 1.7 percent last year. I speak to the parents of young children. They aren't getting 4 percent compensation increases. "One thing they all have in common is that they strongly support this district's educational mission and understand the need for a yearly real estate tax increase to compensate for inflation," Knauss said. "But when I mention 4.6 percent increases, they are universally opposed. "Our current compensation package and working conditions are attractive, and we have no problem attracting and retaining excellent teachers," Knauss said. "In summary, a 2.1 percent compensation increase is fair to both the teachers and the taxpayers. I'm hoping that the leadership of the Education Association will move toward an offer that is in line with what others in the community are experiencing." In strong contrast, board member Joe Rock said, "I don't live in a 2 percent world. I don't think you ought to live in a 2 percent world. We are one of the richest school districts in the country. We didn't get great by being cheap. We are not going to stay great by being cheap," he said as the audience applauded. "I was appalled at the vote at the last meeting. I do think there are problems with folks on fixed incomes. I do think there are problems with folks who live on Social Security. But there are ways around it. There is stuff happening in the state legislature that may move the financing of education away from property taxes to income taxes, which would be paying for Unionville-Chadds Ford on the basis of the ability to pay through income. "It took a lot of very hard work and a long time to make this district one of the great school districts in the country," Rock concluded. "It's real easy to break it." For details of the proposed final budget, and contact information for school board members, visit www.ucfsd.org.